Eight Florida players (a full 25% of the USA contingent of 32 players) are representing the USA in Croatia this week. 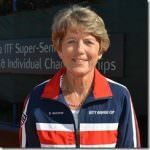 The ITF Super Senior World Team Championships are the equivalent of Davis and Fed Cup for senior players. 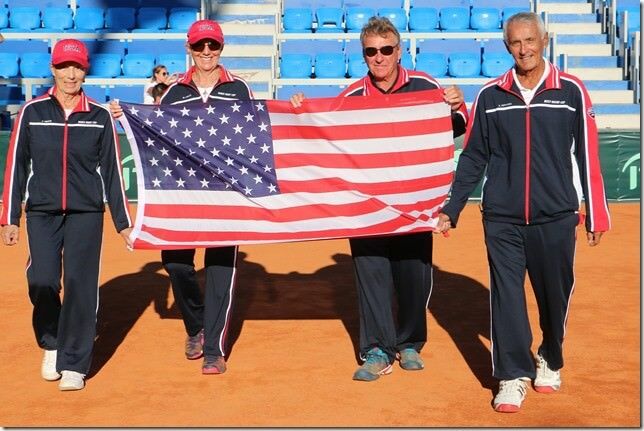 The USA has sent eight teams of four players each in the men’s and women’s 65, 70, 75 and 80s to Croatia for this event. 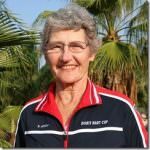 In the women’s 65 (Kitty Godfree Cup), Kerry Young (Maitland) is the #1 player and Carol Clay (Fort Lauderdale) is the #3 player. The USA, as the defending champion, is the #1 seed. 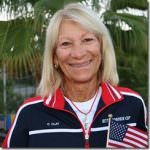 In the women’s 70 (Althea Gibson Cup), Betty Wachob (Panama City), playing in this division for the first year, is the #1 player and the captain of the team. Wachob is undefeated in singles in the 70s this year. She won the National Clay, Hard and Grass. The indoors has yet to be played. The USA is seeded #2 in this division. 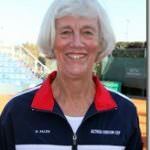 Donna Fales (Coral Gables) is captaining and playing #2 on the Queens Cup team (women’s 75). 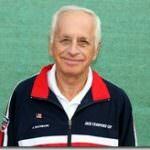 The USA is the defending champion and top seed in this Cup. 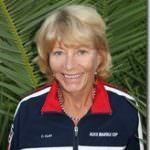 Rose Austin (Naples) is captaining the women’s 80 (Doris Hart Cup) team. This is the only Cup the USA has never won. The USA is seeded #3 in this division. 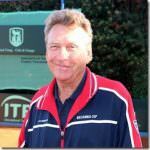 Owen Robertson (Lake Worth) is playing on his first Cup team, men’s 65 (Britannia Cup). The USA is the #2 seed. 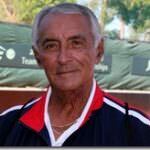 Joe Bachamann (Sarasota) and Rudy Hernando (Fort Lauderdale) are the top two players on the men’s 75 (Bitsy Grant Cup) team. Between them they won all four singles nationals this year. The USA is seeded #4, having finished 7th in 2014. To see the draws, click here. Opening Ceremonies were held today. Each country was allowed to have four players march into the stadium in Umag while their teammates and friends watched from the stadium. Hernando was selected to be part of the team carrying the flag today. That’s Rudy on the right below. Rudy almost didn’t make it to this competition. Warning: Do not lose your passport! The big news yesterday was that Rudy Hernando arrived in Umag 26 hours late. Rudy flew from Fort Lauderdale on September 17th to Philadelphia and then was supposed to take a flight from Philly to Venice, meet up with us and go to Umag from Venice. The first part of the plan went well, Rudy arrived in Philadelphia…where his passport was stolen shortly before he was to board. He had it in his backpack in a cover with a string attached…someone apparently reached in and grabbed the lanyard and ended up with Rudy’s passport. Rudy has a cell phone but no computer, no international phone plan and no smartphone. At the airport he was told he could get an expedited passport in Philadelphia the next day. So he and his tennis bag went to Philly, walked for five hours trying to find a hotel…(not an easy feat since the Pope is coming to visit very soon). He finally found one, then went to the passport office the next morning early…and was #80 something in a slow moving line. He finally got his $95 passport for $400 (expedited fee $150; fee for not knowing his passport number $150) and checked out of his hotel (late…hotel waived fee though). He was back to the airport going standby (#USAir didn’t charge him for the change, which was great of them). However there was one last bit of drama when Rudy realized he’d checked his wallet and money with his luggage…30 minutes later he was reunited with his luggage, rechecked it and was on his way to Venice…maybe. Actually, he was…someone didn’t show up so Rudy got one of those comfortable middle seats in the back of coach for the eight hour flight. So now he was in Venice, and had to get to Umag…which he did by bus to the train station then train, then bus back to the Trieste Airport where the ITF found him. I ran into him last night just as he’d arrived at 8pm. He had had nothing to eat all day, and was tired but relieved to be here, as was his team and so was I. #4: Don’t lose your passport!! !